Overflowing crowds packed CapeTown’s venerable jazz venue, Straight No Chaser, this January to imbibe a new year dose of jazz improvisation from four distinguished musicians across several age ranges. Quirky free jazz Capetownian pianist, Kyle Shepherd, elder drummer Louis Moholo-Moholo, and bassist Byron Bolton, brought together British/Caribbean tenor saxophonist, Shabaka Hutchings, for several evenings of unusual performances during the hot week of 13-16 January 2016. I walk in late. Moholo’s frantic drums are spitting away. Kyle taps away on piano keys influenced by various objects strewn across the piano strings, like wooden sticks and cardboard. Nice harpsichord effect amidst an intense melody-absent improvisation. This foursome chatters, talks about important things, expresses emotion through various thumps, instrumental grunts, plucks and wails. Now, what are they all talking about? Pianist Kyle then picks up a drum mallet, and starts hitting the piano strings, with purpose, not randomly, it seems. Double bassist Bolton eyes drummer Moholo as they share secret things behind their tapping, bow strumming, and pitter patters. They dance together, not necessarily in rhythmic harmony. There is no ¾ time. There is no time, just presence, the now! Shabaka’s sax offers undertones and subtle nods as a wrestling match ensues. Who’s refereeing this road race? All four of them! It’s intense, and after 25 minutes, I’m exhausted. Time for applause as one watches the two ceiling fans seriously pushing warm breezes in this packed venue. We are all seeking relief from a January heat wave. This cozy venue of Cape Town’s Straight No Chaser needs to be five times bigger to hold offerings by, simply put, The 4Blokes, who performed additional nights due to popular demand. And still the music fans keep coming to these sold-out shows. The band simply advertise themselves as: “A pioneering free jazz drummer. An award-winning British saxophonist. A virtuoso young pianist. A bowing bass maverick. Four band leaders. 4 Blokes” . 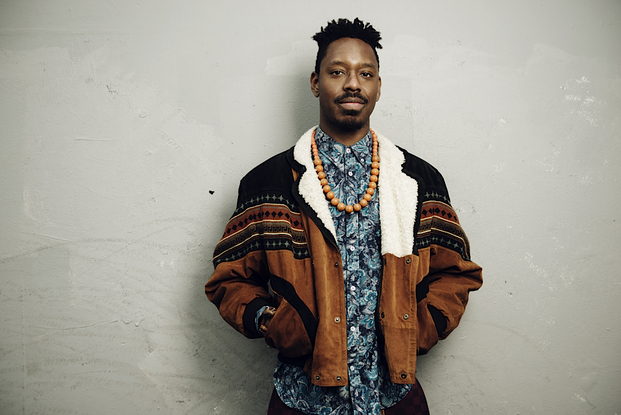 The visiting tall lean Londoner saxophonist, Shabaka Hutchings (http://www.shabakahutchings.com/) has a number of impressive awards and experiences with notable bands. His second Sons of Kemet album was released in September 2015 as he continues his research on the musical influences amongst the Caribbean diaspora in Britain. 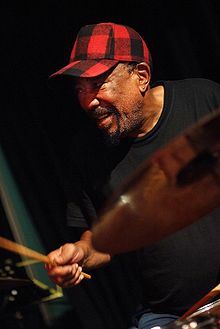 Back to his Cape Town concerts, he survived the ring matches with drummer extraordinaire, 77 year old Louis Moholo, who has absorbed every worldly influence on jazz improvisation since his early beginnings with Chris McGregor’s The Blue Notes, and then the Brotherhood of Breath in the 1960s/70s. Moholo doesn’t age; he just gets better. One doesn’t just ‘listen’ to him; one watches him. He’s very much engaged with his percussive instrument which becomes an extension of his own humanoid discussive personality. Likewise, the enigmatic bowing bassman, Brydon Bolton, shows prowess when his bowed strings wrestle with the group’s improvisational quackery. He’s another watchable performer bordering on the classical traditions and jazz improve, as manifested in his electro-acoustic band, Benguela. All four ‘blokes’ are composers with propensities for ‘free jazz’, the experimental, and home ethnics. Theirs is hardly conventional, even though several songs in their recent gigs were traditional bebop jazz of another era. There lies their inexorably creative improvisational talents!